One cannot understand Christian Benda without taking into account this stream of musicians out of which he was born. His biography doesn’t begin with his birth. He really is one element in a continuous chain of musicians travelling throughout Europe maintaining a unique musical tradition while the notion of nationality was fading out giving place to a premature notion of world citizenship. Christian Benda has performed worldwide to critical acclaim, at major music centers in Paris, Vienna, London, Rome, New York, Hong Kong, Milan, Budapest, Prague, Warsaw, Singapore, Sao Paulo, Bucharest, Florence, Zurich, Shanghai. 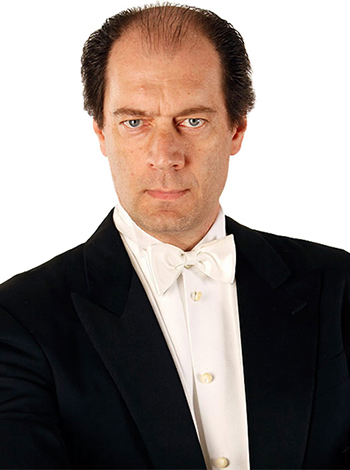 He is Chief Conductor and Artistic Director of the Prague Sinfonia Orchestra and is invited by orchestras such as Orchestre de la Suisse Romande, Moscow Virtuosi, Polish National Opera Orchestra, Shanghai Philharmonic, Slovenian Philharmonic, Matav Orchestra Budapest, Slovak Philharmonic, Stuttgart Chamber Orchestra, Cyprus State Orchestra, Bucharest Radio Symphony, Belgrade Symphony, Muenster Philharmonic, Prague Chamber Orchestra, Orquestra Sinfonica do Estado de Sao Paulo, Orchestre de Chambre de Lausanne, Prague Radio Symphony Orchestra, Orchestre d'Auvergne, Orchestre de Cannes, Orchestra della Toscana, Turin Philharmonic, Lviv Philharmonic, Janacek Philharmonic, Ulster Orchestra, Orquestra do Teatro Municipal do Rio de Janeiro, Zagreb Philharmonic, Orchestra della Svizzera Italiana, Brno Philharmonic, Prague Symphony Orchestra. He performs at international festivals including: Schwetzingen, Echternach (Luxemburg), La Roque d’Anthéron (France), Cité de la musique (Paris), Prague Spring, George Enescu Bucharest, Wratislavia Cantans (Poland), Clifden Arts (Ireland), Campos do Jordao (Brazil), Hong Kong Arts, Klangbogen Wien, Styriarte and Steirischer Herbst (Austria), Lugano Festival, Menuhin Festival (Switzerland). Amongst the instrumentalists having performed with Benda are Lazar Berman, Michel Béroff, Till Fellner, Francois-René Duchable, Mikhail Rudy, Josef Suk, Vladimir Spivakov, Pierre Amoyal, Uto Ughi, Bruno Giuranna, Paul Tortelier, Boris Pergamenschikov, Philippe Entremont, Jean-Philippe Collard, Cristina Ortiz, Marc Coppet. Benda also conducts melodramas with stage actors and directors of the Wiener Schauspielhaus, the Volkstheater, the Burgtheater (Vienna) and the Comédie Française (Paris) such as: Maddalena Crippa, Andrea Jonasson, Hertha Schell, Peter Uray, Brigitte Quadlbauer, Mercedes Echerer, Erika Pluhar, Jean-Luc Bideau, and Francois Rochaix. Benda produced numerous CD and TV recordings of the standard repertoire such as the complete overtures of Schubert and Rossini, and an eclectic repertoire ranging from J S Bach’s Musical Offering to twentieth century symphonic works by Casella, Malipiero, Prokofiev, Debussy, Martinu, Enescu and Stravinsky, taking in along the way C P E Bach’s symphonies and curiosities like Philidor’s overtures and Knecht’s Pastoral Symphony. His recordings with soloists include works by Wagner and Richard Strauss with Cheryl Studer, Verdi with Simon Estes, Mozart with Barbara Hendricks, and Dvorak, Puccini and Previn with Renée Fleming. Also on the list are Frank Martin with Paul Badura-Skoda, Haydn with Jean-Jacques Kantorow and the Verdi Requiem with the Prague Philharmonic Choir. As a composer, Christian Benda has created the concept of micro-opera, and his works have been premiered at the Vienna Konzerthaus and the Prague Smetana Hall. As a cellist, he performs the complete Bach solo suites, Haydn and Dvorak concertos, Tchaikovsky Rococo Variations, and has recorded the Schumann and Stamitz cello concertos. He appeared with Vladimir Spivakov, Josef Suk, Norbert Brainin, and Paul Badura-Skoda in Brahms' double and Beethoven's triple concertos, and in Mozart's Sinfonia Concertante. Christian Benda received his musical training within his family, like in former days, and acknowledges with gratitude his debt to his father, with whom he studied music practice and theory over many years and recorded the cello-piano repertoire. For the cello, he created the 'Christian Benda System', a device which regulates the distance between chest and instrument, giving advantages which are both anatomical and technical.